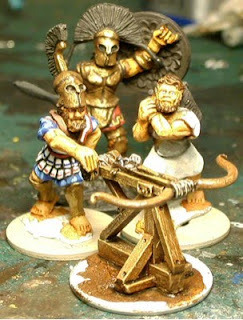 Here's a composite resin/metal Old Glory model that I wanted mainly for it's primitive look. Historically, it only appeared on the battlefield in the last few months of the war. So, with most of my Germans in the early to mid-war uniforms, I would only use this piece in a fictional scenario. Or maybe class the guys in pickelhaube helmets as reservists (although even they would be in the newer uniform and stahhelm by the time the A7V entered into service). 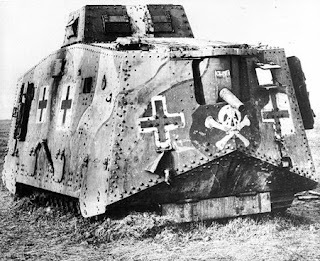 In fact, I don't think this tank was even used against the French (which is my other Great War army); I think the French were pretty much drained, both physically and mentally, by 1918 and were letting the Anglo-Americans finish things up. 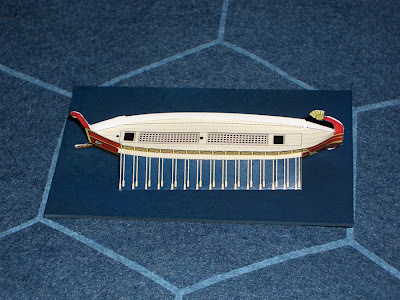 The model was very easy to build - basically the top half in resin and the tracks in metal. It is very heavy, and gives the impression of a large ponderous behemoth - just like the real ones! I was debating doing it in camo, but thought it looked more "WW1" in plain feldgrau. This was the basic paint job for these tanks, of which only around 20 actually were on the battlefield before the war ended. I used my 20-dolla Testor's Aztek airbrush for the initial coat of dark grey. Then the dang thing wouldn't work again, so I ended up dry-brushing over the base coat with successive coats of Vallejo Field Grey. 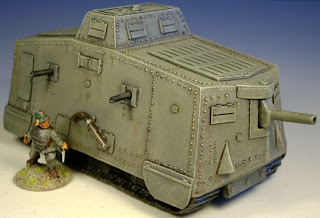 I actually had a nice coat of lighter stone-grey, but then I read that the actual tanks were painted feldgrau - so I did double the work for my error. 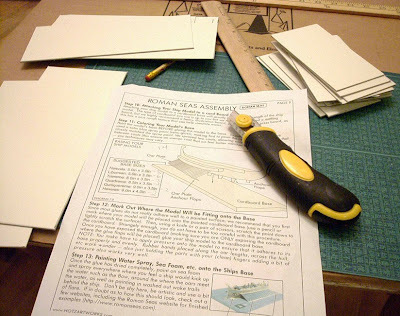 This is the problem with projects like this. I had done some pretty good research some time ago, then forgot all about it after being side-tracked on other projects. 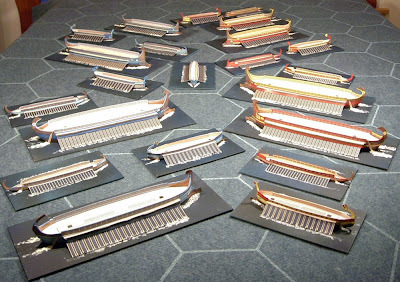 Luckily I had all the websites bookmarked - although I should've looked at them again before painting. 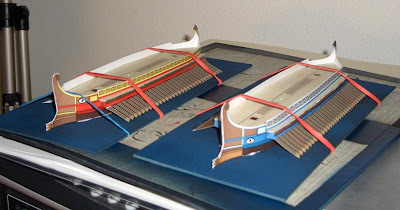 The painted model was given a brush on finish of Future for protection. 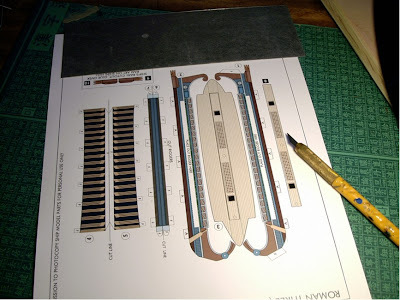 Even with careful (read light) brushing, some of the detail work, like shading around the bolts, ended up running. I may go over these details again. It also still needs markings like Maltese crosses and maybe a name, like "Thor" or something like that. 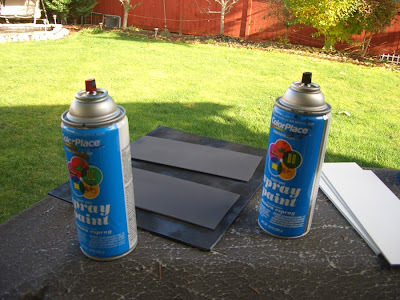 After the markings are applied, the tank will be given a spray coat of matte. 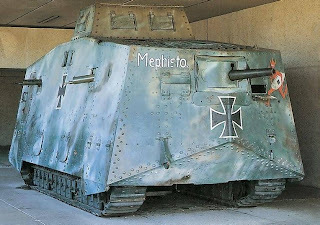 The photo above shows the rear of the vehicle with two of the six MG08 HMGs - which are basically copies of the Maxim HMG. The front of the tank has a 57mm main gun mounted on a swivel. Here's a surviving example which was captured by the Australians at Villers-Bretonneux, and now appropriately displayed in the Queensland Museum Down Unda. A wartime photo of one that appears to be painted in camoflage. 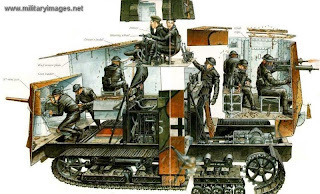 A schematic showing the crew and inner workings of the tank. Here's a shot of three A7Vs with their crews indulging in the favorite past time of soldiers - pouring over tech and field manuals (yeah right!). These were likely the last games we played for 2009. I hosted two Great War games and Adrian and Bruce D. gamed a scenario from our ongoing Lyonesse game run by Wes. 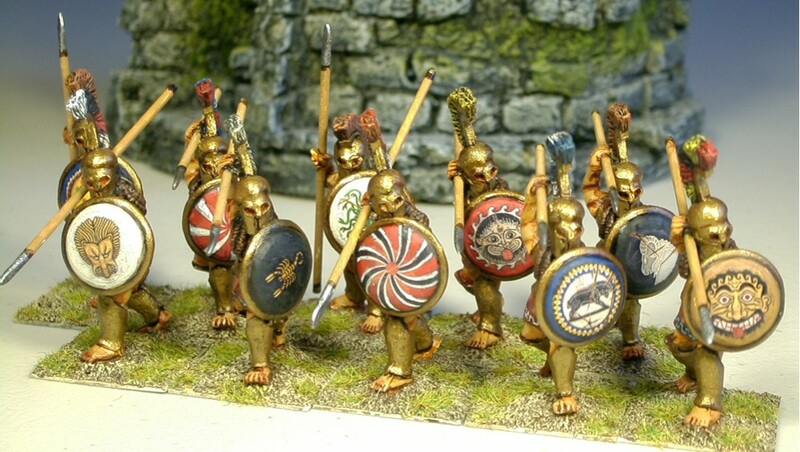 Here's the Lyonesse game using Shieldwall rules. Bruce was victorious with his Dalrianans - as he has been for most of the campaign. My Murchians conceded him the right to be their High King earlier in the campaign - oh well. 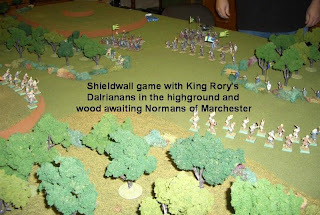 During the Shieldwall game, Dan and I played a Great War game. This was Dan's first game and my second, but we feel we got down the basic rules pretty quick. 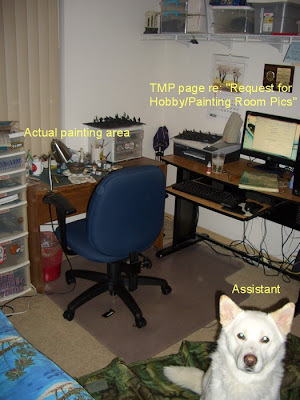 It is basic Warhammer type of rules. Dan said he liked it, and I do too. 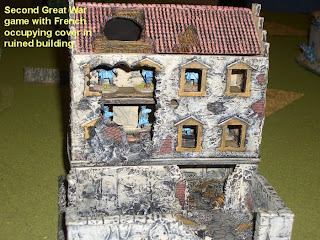 We also played a second Great War game with Adrian playing the French and I played the Germans. 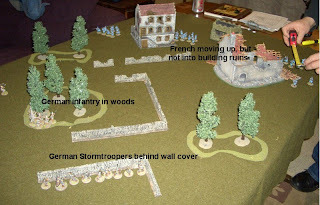 Both games allowed the French to occupy the building ruins for cover. However, in the first game, Dan opted not to use them and advanced upon the Germans swiftly. I had classed two of the French platoons as reservist to lower their BS, thinking they'd be in cover and didn'twant them to too easily pick off the advancing Germans. 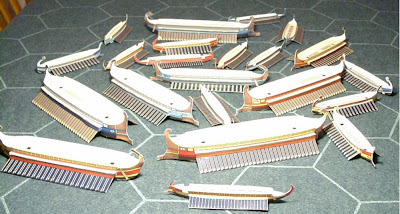 Dan still used them well and most of the casualties were attributed to close combat. The Germans doing well in both games, taking out a French platoon in both games as a result of close combat. As with all shooting games, proper use of cover is important! In the second game, Adrian played it conservatively and placed his two reserve platoons in two building ruins - which is the scenario I initially had planned. This made the game a rather drawn out affair as we called it quits after about 6 turns and the Germans still hadn't reached the buildings to use their flamethrower. 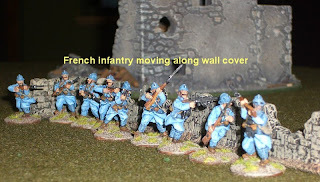 I will have to reevaluate the set up to have them reach the French in cover sooner. We were satisfied with the mechanics of the game and believe it should be a good type of game for a convention. Here's a group of figures I've had for awhile. In fact, they were the first WWI figures I ordered - along with the OG French Trench Fighters set. I don't even know if Warhammer's Great War rules were out yet, but I just liked the look of the figures. Now, they will supplement two platoons of regular infantry. The other figures are in the older uniform wearing pickelhaubes, but I don't mind getting these guys in the fight. It's hard to make out in the photo, but the trousers (hosen) are the stone-grey type introduced in 1915 and used for a little while - with or without red piping. When a better material was found they reissued trousers in feldgrau again in 1917. The stahhelm (steel helmet) these guys are wearing was introduced in 1916. However, not all troops received the newer helmet at once. There are photographs of Germans at Verdun (Feb-Dec 1916) still wearing the pickelhaube. Then again that was a very long battle. Here's a posed shot that could be captioned, "It's gonna get real hot real soon!" or something corny like that. 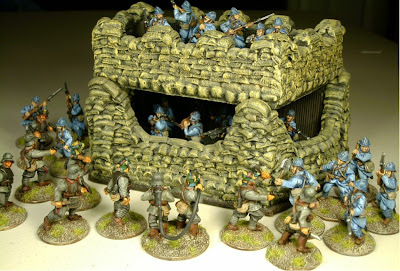 OG French defending. And last, but not least - the OG Hussite War Wagon that I traded with a fellow TMPer for my Great War Miniatures Jagers came in the mail today. There was also a bunch of handgunners and flailmen thown in - more than I had expected. This piece will carry the Battle Standard for a Feudal German army. 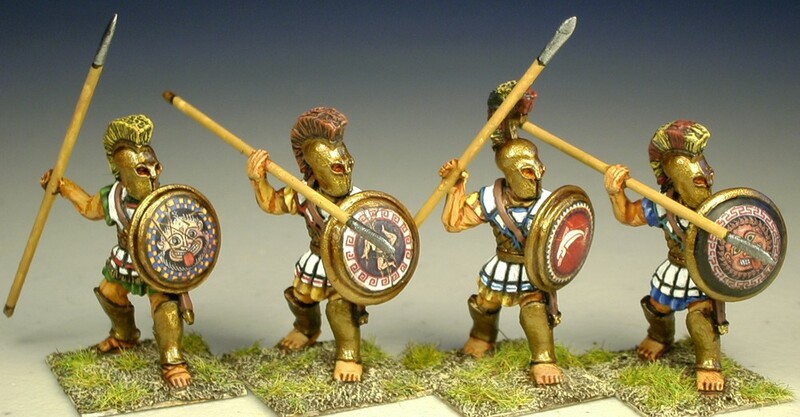 I must say that I've had several very good trades using TMP - including the hoplite shields on a recently completed Greek army. Finally finished this set. 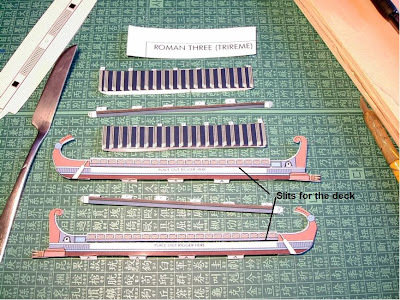 The Oxybeles, a type of catapult, was used from around the early-4th century BC onwards - with some modifications and improvements. This one should fit the bill for anything in the Hellenistic era. 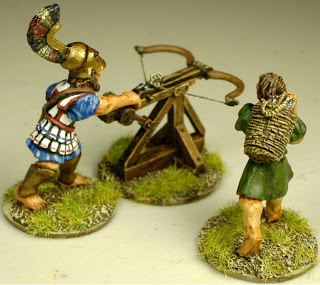 The guy aiming the weapon has a nicely-sculpted Corinthian helmet, pushed back in the classical way. The weapon is a bit lighter-colored than in the photo taken with artificial lighting. 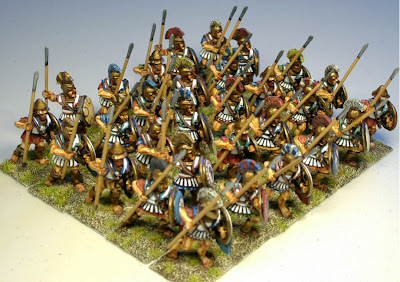 Together with the two phalanx units and Thracian peltasts, the foundation for a Greek army has been laid. 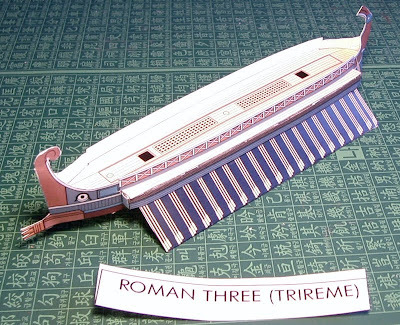 I'm sure I'll add another phalanx (or two) later, but I'm not in any rush right now. 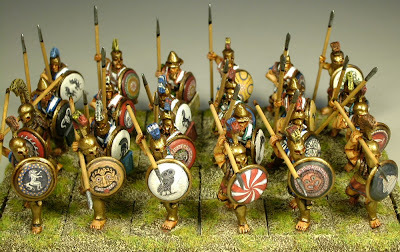 In fact, the initial plan for the Greek hoplites was for them to be mercenaries for a Macedonian or Successor army. As far as other projects, I ended up trading the Great War Miniatures Jager to a fellow TMP member for an OG Hussite War Wagon and some flail men. Although the GWM Jager were nice looking, they were too big to go along with the OG figures I already have. 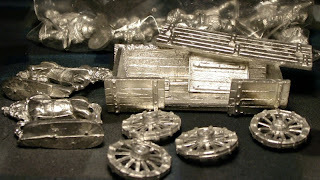 What I would like to use for Jager are Foundry figures from their Franco-Prussian War range. Their main difference, as far as I can tell, is the shako is uncovered, but I can live with that. 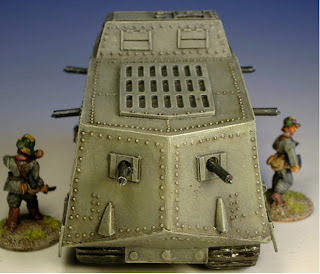 The War Wagon will be converted to a Battle Standard Wagon for a Feudal German army. I also primed the OG Russo-Japanese War Japanese infantry and Perry French Heavy Cavalry. Tomorrow, I'm heading out to the Edgewood Bunker to try out the Crusader rules for a HYW game. Alas, before I could work on some figures for Great War, I got sucked into another project. This time it's a box of Perry French Napoleonic Heavy Cavalry. I had asked Chris Ewick of The Game Matrix to order me a box sometime ago - when I was deep into Sharp Practice. I hadn't heard from Chris in a while, and I thought it may have been due to the postal strike in the UK. 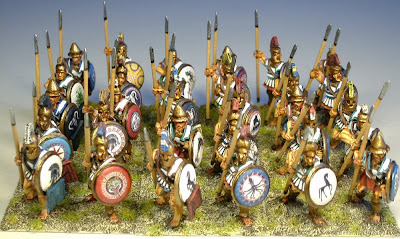 In the interim I'd shifted interests, first Roman Seas, then some 1st Corps and OG hoplites. Anyway, Chris emailed me yesterday to say the box was in - so, like a fool I stopped in the Game Matrix today. 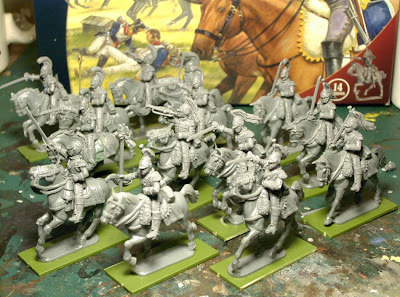 Long story short, these are some really nice figures.There are enough parts for 14 mounted- either all Cuirassiers or all Carabiniers (post- 1810 uniform). The box includes six casualty figures (three each French and British). Four flags, two for each for type of cavalry are also included. Since I only plan to use them in small skirmish scenarios, I opted to build both types of cavalry in two units of 7. Even though Carabiniers in this later uniform never fought in the Peninsula, I couldn't resist the white coats and copper-plated breastplates. I can always order more if I "need" bigger units. 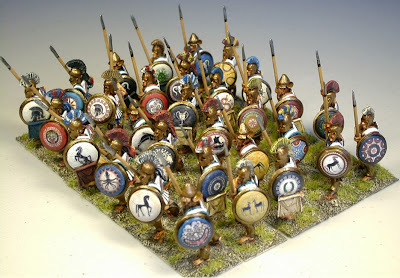 Since there are 14 heads of both types, I have a lot of spares - I plan to use the Carabinier heads on some Victrix French Infantry to represent some eagle guards. For whatever reason, three trumpeter bodies (torsos) are included, so a musician for each unit was no problem. There is only one arm carrying the staff and eagle. 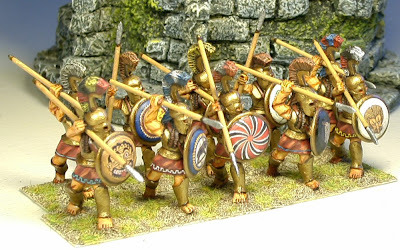 However, I had a spare Victrix staff and eagle, so with a little conversion on a sword arm, I had an eagle bearer for both units. The horses are very beautiful and come in halves - so poses can be varied. There was only one horse with an officer saddle - which I will use for the Cuirassier officer. For the Carabinier officer's horse, I cut off the portmanteau (saddle bag on the rear the saddle blanket) from one of the horses - as officer didn't have these. Then added Green Stuff for the blanket. I still need to add the sword scabbards and maybe the carbines. I recall reading somewhere that they didn't really like carrying the carbines. The box includes six casualty figures - three each French and British.. All in all, I don't regret ordering these. Needing a break from painting, I did some prep work on a couple of projects that are intended for Warhammer Historical's Great War rules. I've already tried out these rules with my younger son sometime ago and found them enjoyable - on the simpler side, which suits me just fine. 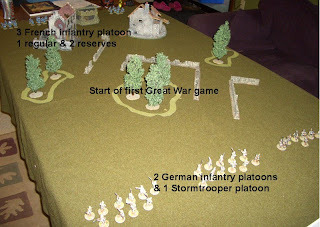 I only used the basic infantry rules - movement, shooting, and hand-to-hand combat. In the future, I will add artillery, cavalry, and possibly a tank. First up: Early war WWI German Jaeger from Great War Miniatures; one pack each of Jaeger Command, Jaeger, and Jaeger MG team. 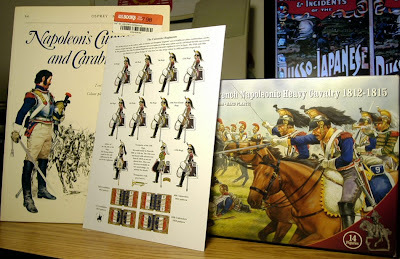 I ordered these from Brigade Games before the last Enfilade - they offered free shipping if picked up at Enfilade (c/o Bruce Meyers). 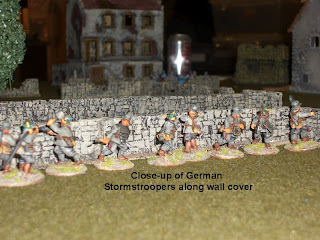 At the time I had wanted to beef up the OG Germans that I already had painted to oppose the French who outnumbered them. The Jaeger looked nice on their website, which they are in-person, but are simply huge compared to the OG guys. 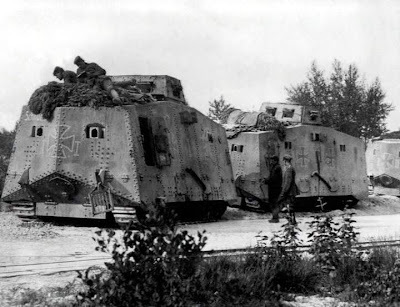 Oh well, their size-difference can't be any worse than throwing in a tank with them - the pickelhaube worn by the OG guys and these Jaeger were phased out by the time the A7V was introduced. The command pack has two officers, a bugler, and several other figures that can be used as NCOs. The MG team comes with a nicely-sculpted water-cooled Maxim MG and three crew - gunner, spotter, and loader holding belted ammo. The Jaeger and Jaeger command come with six figures each. 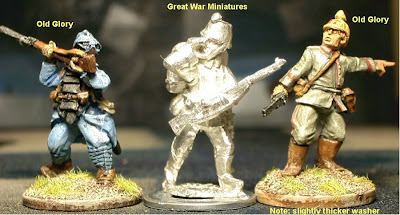 Comparison shot of a Great War Minis Jaeger (obviously raised on double-rations of schnitzel, pommes frites, and weizenbock) looking massive next to an OG poilu and OG hauptmann. 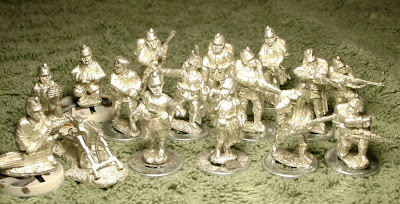 Next: OG Japanese infantry from their Boxer Rising range. 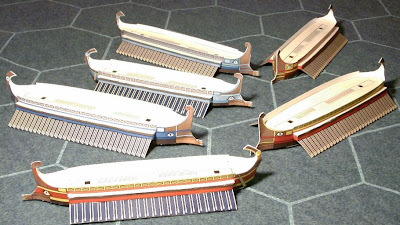 These will be painted for Russo-Japanese War. I don't think there is appreciable changes in the general cut of the uniform or the equipment between these two wars. 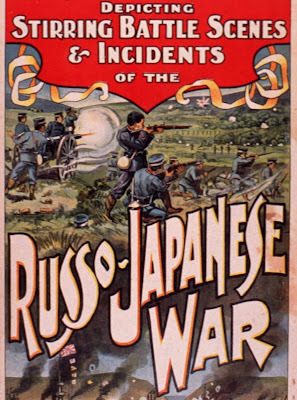 Only several years apart, the Boxer Rebellion (as I identify it as) took place in the summer of 1900, and the Russo-Japanese war from early-1904 to 1905. Most of the land engagements of the latter ending in March 1905 with the Russians' defeat at the Battle of Mukden. 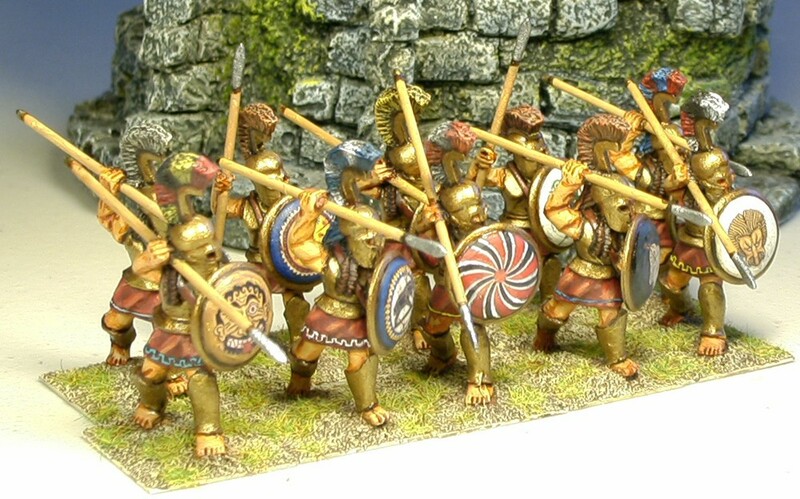 These figures are pretty nice IMO, and there aren't too many figures available in 25/28mm - Redoubt has a few, but sold individually. These were had for about 60 cents a figures - actually a little less as I counted 31 figures when I took this photo below. Hmmm, so I did count the washers correctly - I wondered why I was short one. There are two officers brandishing swords, two buglers, two standard bearers, and four each of six poses (five of the firing pose - with the extra figure). They are mainly running/advancing poses, and as OG does, some of the heads are turned to different positions; none too bad as with some of their other ranges. I also have a pack of artillerymen, two cannon (from the Boer War range), and a cavalry pack. Updates to follow. Extra: 1st Corps Oxybeles and crew (and Spartan lochagos) WIP. I finally finished these guys. They were ordered this past summer when my OG membership was expiring. I seem to be catching up on projects lately. 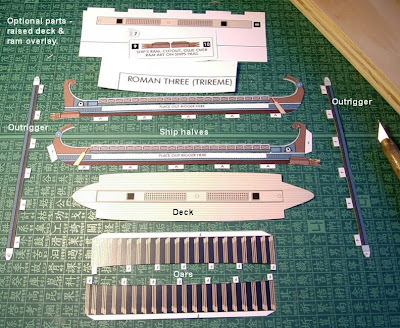 Oh, wait I still have a Roman Seas project to finish - I guess I just got side-tracked. Although these figures have really nice detail (like the interior of the shields), they're not Foundry quality by any means. However, at .60 cents a piece with the Old Glory membership, I'm not complaining. They are fine for rear-rankers. LBM transfers not only sped up the work, but also helped "upgrade" their appearance. The transfers are actually sold for 1/72nd HaT models. 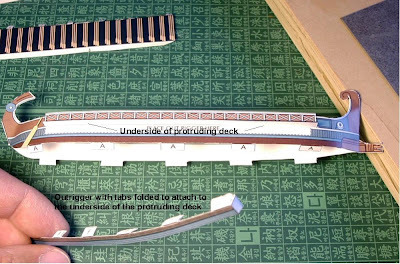 I find the 28mm transfers too large to properly fit on the convex shields. They are all wearing linothorax armor. There is a small amount of metal at the top of the armor - so I suppose these could be classified as composite. I'll class them all as light armor for WAB. 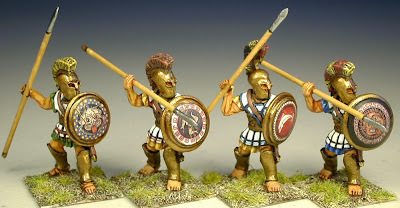 Their helmets vary from what appears to be a Chalcidian, a newer-style Corinthian, a closed-mouthed Corinthian type, an Illyrian, and a Pilos. 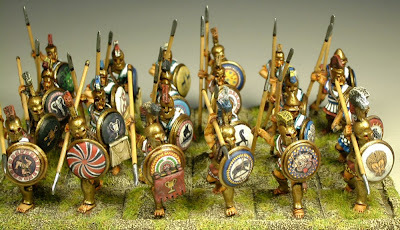 Here are the two phalanx units; the first rank made up of 1st Corps Spartans and Argives, and the subsequent ranks filled in with Old Glory.